Snowdrift and Other Stories includes the eleven short stories collected in Pistols for Two, the only collection of Georgette Heyer’s short stories published before this one, and three short stories uncovered by Heyer biographer Jennifer Kloester that were published in the 1930s: “Runaway Match” and “Incident on Bath Road,” published in 1936 in Woman’s Journal, and “Pursuit,” published in 1939 in The Queen’s Book of the Red Cross, a fundraiser collection. By the time these stories were published, Heyer had already written all of her Georgian novels except Faro’s Daughter (1941), and Regency Buck (1935), the first of her twenty-four Regency-set romances that established a subgenre that remains the most popular form of historical romance these many decades later, albeit markedly different in some ways. 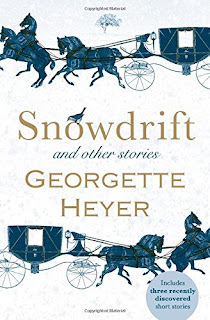 Part of the fun of reading these stories is Heyer’s characteristic wit and banter and the skill with which she creates a world now grown familiar to historical romance readers. Road trips, for example, have long been a popular trope in Romancelandia, and they abound in these stories. The opening story “Snowdrift,” for example, features Sir Julian Arden, a noted whip who aborts his effort to win a bet to rescue Miss Sophia Trent from a coach mishap caused by the snow and get her to her destination (Bath, where her miserly grandfather resides). Miss Trent is an innocent whose lack of artifice wins the hero’s heart. She has no idea who Beau Arden is, and he, who has grown “so bored that nothing kept his interest alive for more than a fleeting moment,” finds her honesty refreshing. She tells him that driving from London through the snow in his curricle is “nonsensical,” something none of the simpering misses or ambitious mamas chasing Arden would have dared do. Kloester notes in her foreword to the collection that the seeds of some of Heyer’s novels can be found in these short stories. For the Heyer aficionado, recognizing the “seeds” and connecting them to the novels is also part of the fun of this collection. However, one does not have to have read Heyer’s thirty plus romance novels to recognize the plots and character types that she introduced. She created the prototypes, and other writers borrowed, imitated, and modified them. In “Snowdrift,” the hero’s athletic prowess (“a crack shot and a nonpareil amongst whips” and “his famous right,” with which he fells a dastard), his clothes (“a coat of superfine . . . from the hands of a master,” his buckskins of “impeccable cut,” and the “intricate style” of his cravat), and his reception once the miser knows who he is will call to mind too many heroes of historical romance to count. The heroine’s background (a profligate father dead at an early age, a kind, virtuous, penurious vicar as stepfather, and a houseful of hopeful half-siblings) and even the miserly grandfather with his unexpected change in status may recall other books. “Pistols for Two,” the title story in the older Heyer collection hardly qualifies as a romance in the usual sense. The heroine never actually appears in the story. Instead the primary characters are a pair of foolish young men hardly out of boyhood, lifelong friends who fall in love with the same young lady, formerly a reluctantly tolerated playmate. A misunderstanding leads Tom to challenge Jack, and the two of them, all injured pride and embarrassing fear, seem set to meet each other in a duel neither wants. The hero is “the London gentleman” who saves their pride while preventing the duel. It is sure to leave the reader with a smile and satisfied with just a hint of romance. Each reader will have her favorites. I gave the book five stars, but I did not love all the stories equally. Among the stories from Pistols for Two, my favorite is “Hazard,” in which a dissolute brother stakes his sister in a dice game. Carlington, a drunken, reckless marquis, wins Helen Moreland, and she willingly leaves her brother. The heroine is pragmatic and controlled, at least on the surface, and accepts his news that the public announcement of his betrothal to another is taking place even as they speak. When Miss Fanny Wyse, Carlington’s fiancée appears at the inn where Carlington and Helen have sheltered, the story becomes farce. Heyer readers will recognize the similarity of characters such as Letty Grayson in The Masqueraders (1928) and Eustacie de Vaubon in The Talisman Ring (1936) to Miss Wyse’s age (nineteen), looks (“soulful brown eyes and a riot of dark curls”), and temperament (impetuous with a broad romantic streak and a taste for drama). I loved the twist of the elopement trope, the contrast between the hero and heroine, who are more alike than they appear, and the humor. And I love thinking of favorites by other authors like Jo Beverley who wrote stories that bear a faint imprint of this one. I also rate “A Clandestine Affair” and “A Husband for Fanny” highly. The former features a pair of lovers—the youthful, spirited Miss Lucy Tresilian and the handsome and sweet-natured, Arthur Rosely and Lucy’s aunt, Elinor Tresilian, “on the shady side of thirty” and Lord Iver, Arthur’s cousin, former guardian, and current trustee. Lord Iver opposes the match between Lucy and Arthur because he wants no link to the family of the woman who jilted him twelve years ago. When Elinor and Iver pursue their young relatives, whom they believe to be eloping, the story becomes a reunited-lovers tale. Elements of this story surface later in Bath Tangle (1955) and Black Sheep (1966). The interest of the “husband” in “A Husband for Fanny” in eighteen-year-old Fanny is strictly paternal, despite her mother’s fond hope. It is the lovely widow herself who has him thinking about matrimony. If you have read many traditional Regencies, you have encountered that plot. “Pursuit,” the first of the reclaimed stories is another tale of an older pair in pursuit of youthful, eloping lovers, the hero’s ward and the governess heroine’s charge. I confess that I was so enchanted by the opening sentence, a marvel of grammatical construction and which, with a name change, could have introduced quite a number of my keepers, that I was won over instantly. The curricle, which was built on sporting lines, was drawn by a team of four magnificent greys, and the ribbons were being handled by one of the most noted whips of his day: a member of the Four Horse Club, of the Bensington, the winner of above a dozen races – in short, by the Earl of Shane, as anyone but the most complete country bumpkin, catching only the most fleeting glimpse of his handsome profile, with its bar of black brow, and masterful, aquiline nose, would have known immediately. The earl’s companion was a governess, a lady, moreover, who would very soon attain her thirtieth year, and who was seated bolt-upright beside him, dressed in a sober round gown of French cambric under a green pelisse, and a bonnet of moss-straw tied over her smooth, brown ringlets. . . . Her eyes, which were a fine grey, and generally held a good deal of humour, stared stonily at the road ahead, and her mouth (too generous for beauty) was firmly compressed. Only two pages in and I’m already in love with these characters and looking forward to watching them bristle and banter as they fall in love with each other. The story may be new to me, but I know it well because Heyer’s influence is pervasive in the genre. Snowdrift and Other Stories invites the reader into an ordered world where laughter and love rule and where villains are defeated, even though few of them are truly evil. I find that immensely appealing in 2017. If you have read Pistols for Two, I think you will find the charm of the stories undiluted in a reread. If you have never read Heyer, these stories serve as a great introduction to one of the founders of popular historical romance. I highly recommend it. Now I’m off to reread more Heyer, starting with my favorite, Frederica. I own Pistols for Two, but now I'm going to have to order this collection, too. Thanks for the great review, PJ! I hope you enjoy the new stories and the rereading, Vanessa. Reading--or rereading--Heyer is always a joy for me. My fondness for rereading is the reason PJ allows me the fun of doing these On Second Thought columns. I think I'll be adding this collection to my reading list, Janga. Thank you! I still remember Pistols for Two. It stands out in my memory. Love Heyer. Not everything she wrote was perfect, but you know, I have never read anything by her which disappointed. Her character development is lovely and her plotting is wonderful and I am gonna have to find this book.